Appliance repair software to run and grow your entire company! 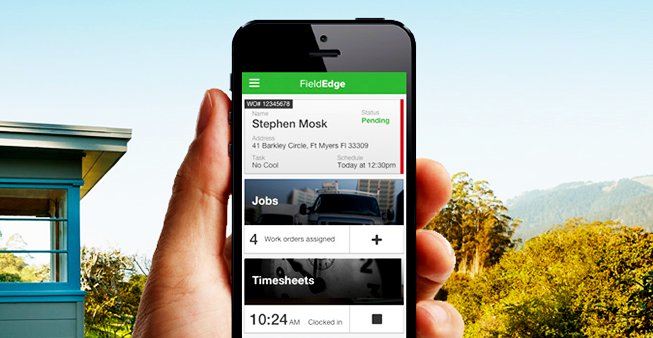 Whether you specialize in sales, service, or both, FieldEdge will help you save time and make you more money. The powerful, yet easy-to-use, app gives your techs the ability to review full work order history, track your customer’s equipment, and take payments in the field. As a business owner you need to be able to access your information anywhere and at any time to see how you’re stacking up against the competition. Easily identify trends in your company to see how employees are performing, what marketing campaigns are working, and your profitability from service contracts. Thousands of contractors have trusted FieldEdge for over 35 years to build highly their highly profitable home service companies. Get the all-in-one platform that will help you streamline operations, boost sales, and create a world class customer experience. Appliance repair companies that specialize in sales can convert more jobs and boost ticket averages with FieldEdge’s powerful mobile tool. If service is your specialty, never loose track of another work order or service agreement. What is appliance repair software? Appliance repair software is used by appliance companies looking to improve their office and field operations. Software is a must-have if you want to get and stay ahead of the competition. What are the benefits of appliance repair? Benefits of appliance repair software include efficient office staff, prepared technicians, and owners who are knowledgeable of all aspects of their business. Software provides all employees the tools they need to succeed in their position. Does your appliance repair software have a mobile app? Does your appliance repair software integrate with Quickbooks? Yes. We built the very first real-time Quickbooks integration for appliance service software over a decade ago. This means no more double-entry and no more batching headaches.